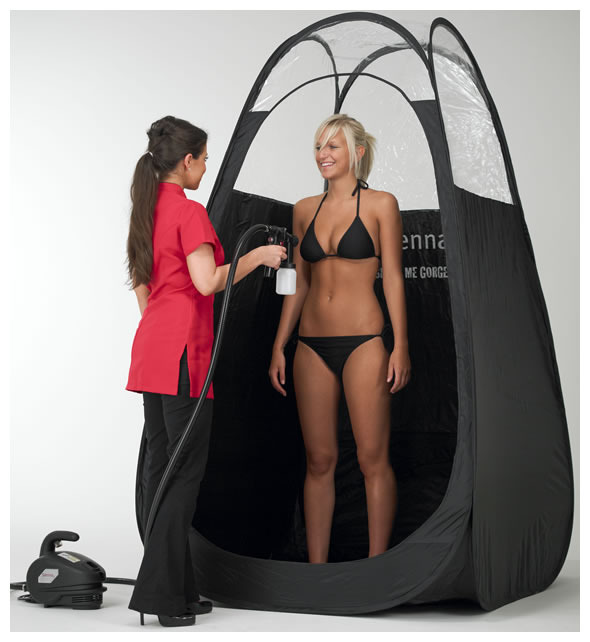 What Should I Expect From My Airbrush Tanning Appointment? If this is your first time getting an airbrush tan, you might be nervous or not know what to expect. Relax, we’ll walk you through it! Find a local airbrushing salon & make your appointment. In Denver, give us a call at 303-722-4040 to set a time. You can come to us (we’re located in Washington Park) or you can make an appointment for us to come to you! We have a mobile tanning station that we can bring to your house and quickly, cleanly give you a tan in the comfort of your own home. Mobile tanning is a fun girl’s night/bachelorette/birthday/pre-prom party activity too – get the girls together and get a tan! The day before your appointment, be sure you exfoliate! You want to remove the top layer of dead skin all over your body. Use an exfoliating body wash or scrub down with a washcloth or an exfoliating brush for the best results. You don’t want the tanning solution to be applied to dead skin because it will flake off and your tan won’t look as even or last as long as it should! Shaving, waxing, facials, manicure/pedicures, massages, and laser treatments should all be done before your tanning appointment. Make sure your skin is as clean as possible – don’t use any oils, perfumes, or lotions before your session as these can block the solution and affect your tan. When you come in, you’ll meet with your technician and discuss your skin tone and how dark you want your tan to be. Feel free to ask any questions you might have! We want you to be as comfortable as possible. The actual tanning process is short and sweet. Wear whatever you’re comfortable with. Some people wear swim suits during their sessions, some don’t – believe me, we’ve seen it all, so don’t be shy if you want full coverage! Your technician will ask you to move and pose so that they can evenly spray your body. It feels like a cool, light mist and the entire process will be over in roughly 15 minutes or so. The solution dries quickly, but sometimes you might notice a smudge or two on your clothing. We like to recommend that you wear loose, dark clothing if you can, but don’t panic – the bronzer easily washes out of most fabrics! After your tan, try to stay dry for at least 8 hours! Avoid showers, pools, and exercise while your tan sets. You’ll also want to keep your skin moisturized. Apply moisturizer daily in the morning and evening to help keep your tan as long as possible. When your skin gets dry, it flakes off and will take your color with it, so keep it smooth and hydrated! Avoid soaps and moisturizers that contain AHA (Alpha Hydroxy Acid) as well as chlorine from pools/hot tubs whenever possible. Long hot showers and baths might also dull your tan. so keep ’em short! You can also apply tan extender solutions that contain DHA – these will help your tan last even longer! We sell these as well, just ask your technician about it. Then just sit back and enjoy your tan! If properly maintained, your spray tan will last up to 10 days – possibly even longer if you apply an extending solution! Most people are surprised by how quick and easy the whole process is and how great the results are. So don’t be nervous – give it a try!